The youngsters, all of them African-American and Latino boys, sat in folding chairs on the stage. “Scholarships!” answered the boys in unison. The boys are in 5th and 6th grades. Each is being groomed to graduate high school and get to college. Van Rensalier runs the “Go to high school – Go to college” program for the Delta Mu Lambda, the Paterson chapter of the Alpha Phi Alpha Fraternity, the first African-American intercollegiate Greek-lettered fraternity in the U.S. The program provides mentorship to 8 boys at School 2 and 10 at the Norman S. Weir School for an hour and half a week. Students learn during their lunch period. Grace Giglio, principal of Norman S. Weir School, said the students meet with Van Rensalier three days a week. She said the students willingly participate in the program. Boys from both schools met on Mar. 27, 2018 for a ceremony to hear from two dozen successful men who look like them. “I’m a first-generation college student,” said Devaun Armstrong, a member of the fraternity, who recently graduated from William Paterson University. Majority of the young boys will be first in their family to go to college which means the boys do not have the basic information about higher education that college graduated parents are able to supply to their children. “Education is extremely important. You can take a bit of knowledge from everyone around you,” Armstrong told the boys. Van Rensalier tries to fill in the information gap. “What does GPA stand for?” asked Van Rensalier. “Grade point average!” the boys, again, replied in unison. Aayan Wade, 10, and Takai McKinnon, 11, both students of Norman S. Weir School, learned to keep up their grade-point-average to qualify for academic scholarships. “We learned about scholarships. Scholarships give you money,” said McKinnon, a sixth grader, when asked what specifically he learned through the mentorship program. “We need a 3.0 to get a scholarship,” added another boy. Wade said he learned that he had to accumulate community service hours. Volunteerism boosts a prospective college student’s chances for admission. “I’ve fed the homeless like five times,” said Wade. He said he has been keeping track of his volunteer hours. Another boy said he has been volunteering at his local church. Van Rensalier, who retired after working at the district, works as a substitute teacher. He gives back to the community through the program. He mentors the boys during his lunch period, arming them with information and strategies to succeed in high school to get into college. “You’ve got to have the mindset early on that you want to finish grammar school, finish high school, and go to college,” said superintendent Eileen Shafer. Mentoring helps to cultivate that mindset. 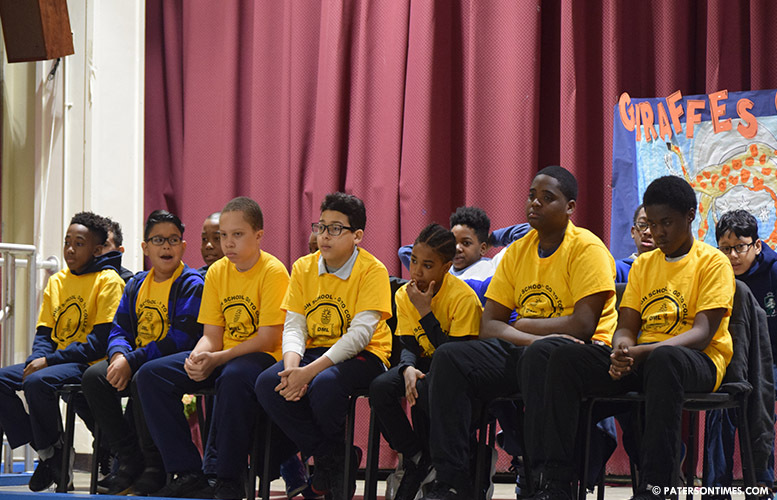 “This program instills the self-confidence you need to succeed later in life,” Giglio, the principal, told 70 boys at the ceremony. When she asked who would like to sign up for the program, more than two dozen hands went up. Van Rensalier said the program is in its third year. He said the fraternity keeps track of the boys through high school. “We told them once they get to their junior year to reach out to us so that we can reinforce what they need to do to get to college,” said Van Rensalier. He said the fraternity also offers scholarships for college-bound students. The program was started years ago to provide assistance to students trying to complete financial aid forms. “We used to do it in high school,” said Van Rensalier. He said the program was brought down to 3-4 grades because reading scores for young people in those grades are used to determine the number of prisons a community needs. Public officials have made this claim for years. Private prisons though do not use third-grade reading data to plan for prison beds, according to fact checking website PolitiFact which looked into the claim. The ceremony called “Alpha Day” ended with a special performance. The men put on what’s called the Alpha steps show, a performance inspired by traditional African dance, for the boys. Prison beds are determined by reading scores of kids in elementary school? I never heard that one before.